I recently had the pleasure of speaking with Sarah Hoppes, the executive producer of Dark Ink Pictures and the wife part of a husband/wife team. Dark Ink currently has several comics that are out for download and your reading pleasure, and you can find them here. This is excellent information for those of you who are looking to pitch your comic in the near future. What was the inspiration behind Dark Ink Pictures? Dark Ink Pictures is the brainchild of myself and Chris Rizzo, who is a writer, editor, and now the Creative Director at Dark Ink. Chris and I both spent many years working in the advertising, film, and editorial worlds, and are grateful to have had the opportunity to hone our skills there. We eventually found ourselves growing unsatisfied with bringing other people’s visions to life, when we knew we had ideas of our own to share. We wanted a creative outlet, where we could put our efforts into telling our own stories, making our own art, and building something we could be proud to leave behind. In the fall of 2011, we launched Dark Ink Pictures to do just that. Dark Ink Pictures is a multimedia production company, and our goal is to tell stories, without limitations on the medium. You go beyond just comics, what else do you do? Currently, our biggest focus is on comic books. We’ve released the initial issues in two ongoing series, Planet of Women, and Cursed Mountain, along with two one-shot comic books, The Patient and Hunters since our launch in October 2011, and we have several more comics in various stages of production. In addition to comics, we work in photography and film, and we have plans to expand to music and podcasting in the future. We did a spec commercial, Justify My Burger, which applies a high fashion sensibility to the concept of fast food advertising, in 2012, and we have a short film in the works to be released in 2014. We also did a photo shoot to promote our comic Cursed Mountain, where we brought characters from that world to life. We photographed three models as the members of “Debbie Does Deathmetal,” an all-girl zombie thrash metal band, and we have plans to do photo shoots with more characters from Cursed Mountain, as well as the characters from Planet of Women. We also have plans to release a sci-fi podcast drama with a comic tie-in. What does one need to do to be published with you guys?We are very open to collaboration, and we consider it to be a valuable part of our business model. Our goal is for the artists who work with us to succeed as we succeed. When we sign on an artist, we always add a link to their work on our site, and we include that link when we mention the project anywhere on our site, and we make every attempt to mention the artists in any press we get about the project.Currently, we are only publishing comics based on our original concepts and characters, all written by Chris. We are always on the lookout for new concept artists, pencilers, inkers, and colorists, because we are constantly adding new scripts to the lineup. For artists interested in collaboration, we ask for an email explaining their experience in illustration, particularly in comics, and examples of their work in visual storytelling and sequential artwork. Then, we set up an interview to discuss the project/s further. If the artist seems like they’d be a good fit for a comic, we send out a contract for the project, with a detailed schedule, and we start the process with concept art. Often, we sign on people to do concept art and a promotional poster at first, to make sure everyone is happy with the workflow and that it’s a good fit, and then the comic illustration is a separate project. 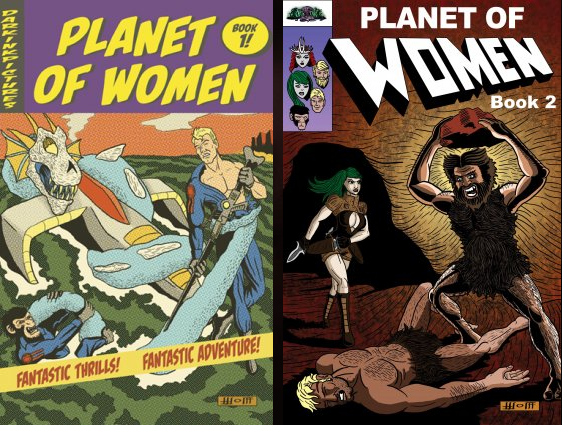 Explain the process of getting Planet of Women out there.The first two issues of Planet of Women are available for digital download at amusedom.com now. This is a six-part series, and when it’s complete, it will be available in print and digital formats as a stand-alone graphic novel, and will be around 350 pages. As you might imagine, the process of illustrating 350 pages is a long time commitment. Chris wrote the script in the fall of 2011, and we first started working with the illustrator, Dan Wolff, in the winter of 2012. The full series is slated to wrap by early 2014. Chris’ script and Dan’s artwork are so engaging, we didn’t want to wait over a year to start promoting them, so we’ve been releasing chapters of the book as individual issues. We also created a trailer to promote the first issue, and we released promotional illustrations for the series. The biggest thing we’ve done to promote the series is to put the books and promos in front of fans as we visit comic conventions across the country. Last year, we went to New York, Ohio, West Virginia, and Tennessee. This year, we’ll be in New York, Maryland, Pennsylvania, Ohio, West Virginia, Arkansas, and Texas. You can view our full convention schedule on our news page. 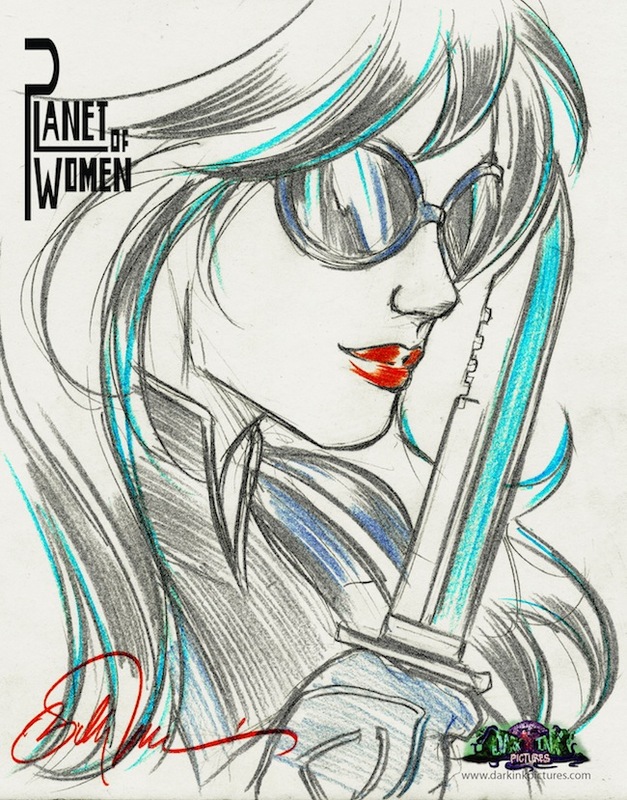 At our convention in Texas (Wizard World Austin), Dan will be joining us and drawing pin ups from the series.